SNAPSHOT: Attention – For Field Marshall Goodluck Jonathan! 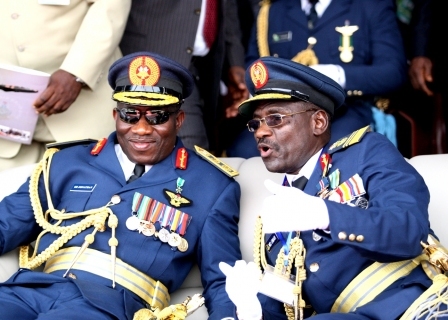 President Goodluck Jonathan, when he was in Kaduna today to formally declare open the 2012 Nigerian Air Force Expo – which is an opportunity for the Air Force to show Nigeriansv and the world just how equipped they are. The president is in full airforce regalia – and we have to say, it sits well on him. If only this made us feel any safer.